Here it is after midnight – to me it is still Tuesday! I wanted to head to bed earlier but I am wide awake, tried but not sleepy. Too many things on my mind. I should have just gotten out my journal and wrote for a while and went to bed. But then I remembered I had not written a slice. *would love to be able to call up someone and just talk, when ever – miss that since our move here. Okay enough. I think I got most of it out. And it did help – thanks for reading this far and giving support. Just been a bad week. *read “Tales of a Grade 4 Nothing” – finally! *flowers are starting to sprout – spring is finally here. This past week was a strange one. I don’t know if it was the aftermath of visiting my father-in-law or suffering from a cold for a few days, but until yesterday, Thursday and Friday passed with little writing, although more time on the computer. I did write a poem for 30 Words Thursday – but on Friday. I didn’t even read any books or articles. My morning newspapers (3) were about it. Late last night (Saturday) though. I finally pulled out my “Fired” story and wrote over a thousand words to finally finish a chapter. I also sketched out more of the planning for the chapters ahead. When I was younger, I was more of a night owl and that seemed to work last night. I am excited though with a writing auction I took part in last week “Writers for Hope”, held by Kelly Johnson, to raise money for RAININ. Unbelievably, I was able to win 4 of the prizes – 3 first chapter critiques and 1 picture book critique. When I can achieve a goal (in this case having my writing critiqued) while helping others, I dive in. Looking forward to the feedback. This week I need to refocus and get busy on my editing and working on “Fired”. I will be finished with my tutoring job this week and then I can hopefully return to the writing routine I followed in January and February. I was much more productive then. 30 Words Thursday, at Treasures Found, is a fun writing challenge, to choose a topic and use only 30 words to expound on it. 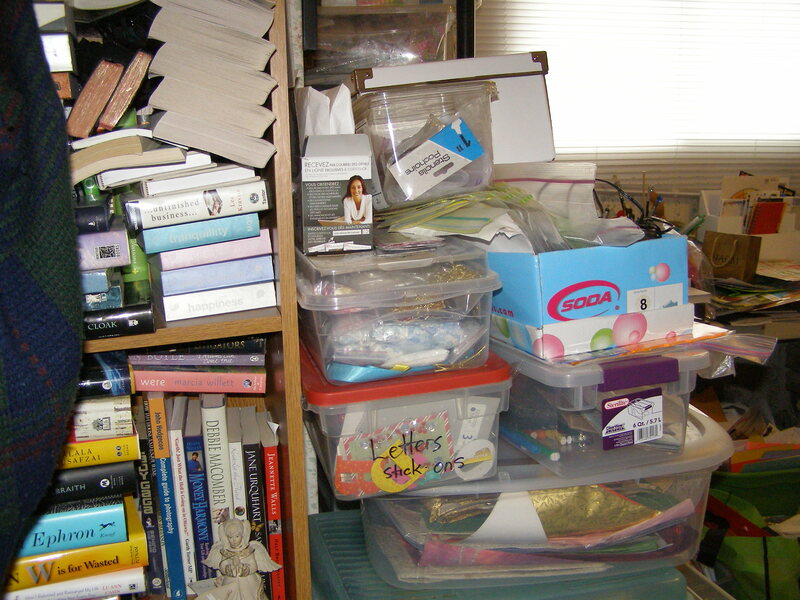 This ode to too much stuff is my nudge to tackle the books, magazines and other things that fill the spaces in my home. It’s Midweek Check-in at ROW80. I missed Sunday’s check-in as we were in Montreal and had limited access to a computer and limited time. But the 8 hour drive there and back was very conducive to writing, editing and reading. I was able to get more done that I had thought I’d be able to. *I read 6 good articles on writing. *I reread the critique I had done on my historical MG novel and did more planning and editing of it.. I gained two readers this weekend for my romance novels. This will give me a chance to get more feedback. It has also spurred me on to return to finishing the numerous romance novellas I have in various stages. I will be finished tutoring next week and so will be able to devote more time to writing, which I am really looking forward to. 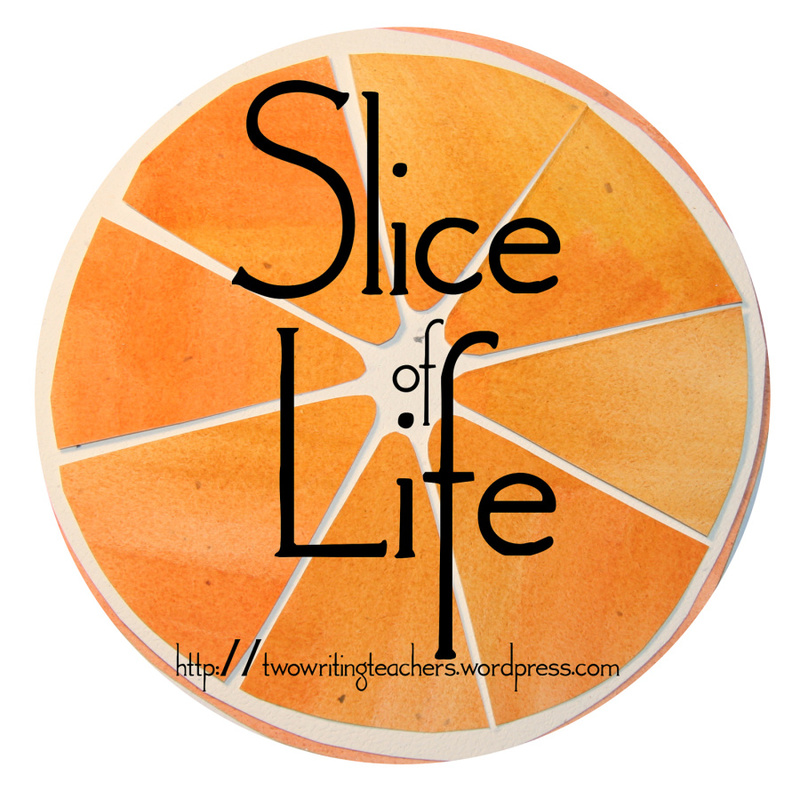 Today is “Slice of Life” Tuesday – a wonderful writing challenge hosted at “Two Writing Teachers”, that encourages us to share a slice from our lives. 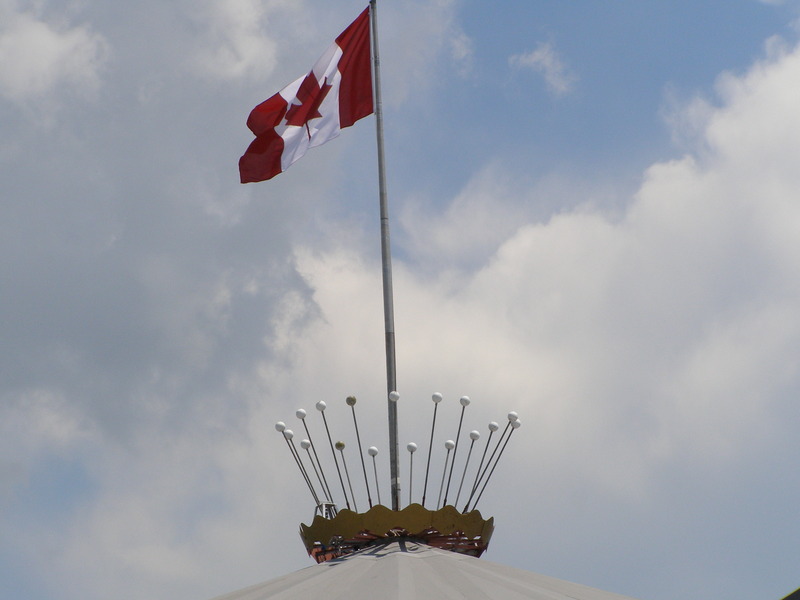 A quick change of plans last week resulted in us travelling to Montreal this Easter weekend, rather than celebrating at home with my husband’s children and grandchildren. My father-in-law’s health had begun to decline in the past two weeks. At almost 88, he was frail and everyone feared the worst. All of the siblings converged on Montreal for a visit. After an eight hour drive, we went to Bill’s sister’s place, the one who has most of the care for their dad. Then his brother and wife arrived. We had pizza and wine and spent a couple of hours sharing stories and catching up. If nothing else, this weekend gave the siblings a chance to talk about their dad, his needs and what they needed to do in the days and weeks ahead. We visited Dad on Saturday and Sunday and it was heartbreaking seeing him so changed. We had last seen him in August and although he was in a wheelchair, he was alert, interested and well, Dad. This weekend, he slept most of the time, hunched in his new chair. When he was awake, he mumbled or spoke in short bursts. He has lost so much weight and looks unwell. I am so glad we went. My husband needed to see his dad and the siblings needed time together. We are all saddened by the changes and know it will be only a matter of time before we return to Montreal for a different reason. 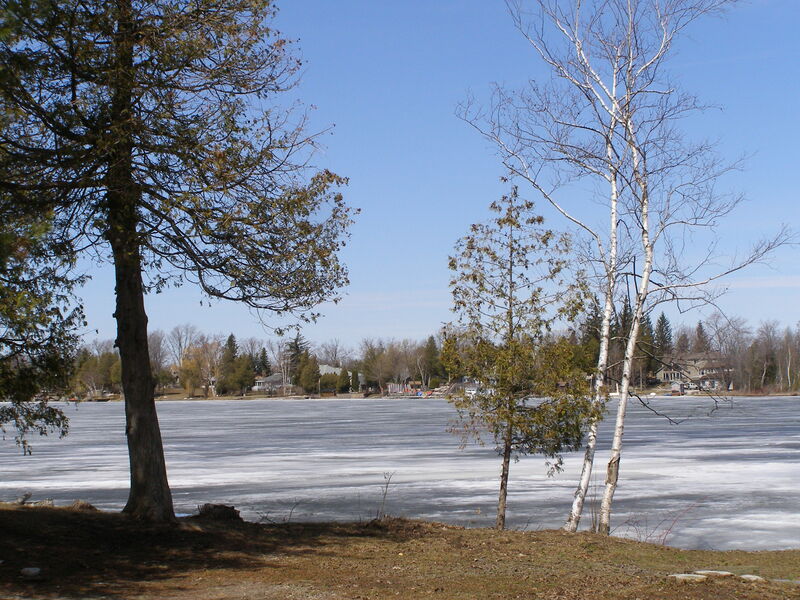 This poem is in honour of spring that has come to the lake – finally! Check here at Treasures Found for other 30 Words entries. I have been writing much more this past week and I am on track for a number of my goals. * I wrote every day, working on a new story this week. One chapter written. * I have read a number of writing articles this week. * I have been reading a number picture books this week. Continuing to study them. * I took part in “It’s Monday. What Are you reading?” and wrote a post for it. We are heading to Montreal for a few days – my father-in-law is not well. I will take some writing to work on but probably won’t get a chance to blog/write posts. See you next Wednesday. It’s Monday and time to share books read over the past week. I read a couple of good MG novels, both historical fiction. 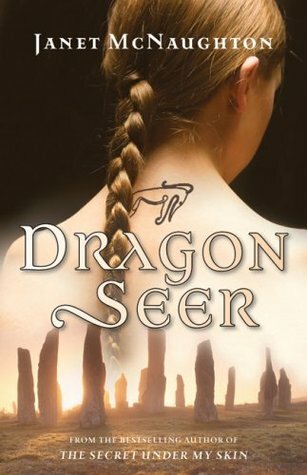 Last month I had read “Dragon Seer’s Gift” and had enjoyed it. I found the first one at the library last week and read the first in the series. Loving Scotland and dragons made the books that much more enjoyable. McNaughton gives us a plausible story of the early Picts and their demise. An enjoyable read. In 1923, Hattie is laded on the Orphan train with many other orphans, bound for new homes in Nebraska. She is taken in by farmer Henry and his wife Elizabeth. 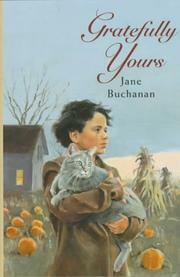 Buchanan shares Hattie’s life as she adjusts to life in a new place, with a new family. An interesting look at the Orphan trains that brought thousands of children west, a chapter of history I knew nothing about. The first week of the 80 day challenge and I am on track for a number of my goals. * I wrote every day, working on a number of small projects this week. * Saturday, I pulled out all of my romance novels (13) and went through them, making a list of the titles, chapters writing and what was needed for each. I have decided to return to writing these and finishing them all. When I was taking in our taxes on Friday, I was talking about writing with our accountant there and she ended up offering to read my novels. I sent two Friday night. * I have read a number of writing articles this week. Lots of good advice in different areas. * I have been reading a number of MG novels and picture books this week – studying the form of both. * I took part in “Slice of Life Tuesday” and “30 Words Tuesday” and wrote a post for each. Next week, I hope to work on editing my pix book script “Girl With a Curl” and continue research on “Jacob’s Journey. Today is 30 Words Thursday, a writing challenge to share an experience, an event, a memory in only 30 words, hosted at “Treasures Found”. Today while waiting for my bus, I looked out from the shelter and noticed the birds and the huge flag and this poem had to be written. I took out my steno pad and wrote the words.